The Duff Green Mansion is a historic bed and breakfast in Vicksburg, Mississippi. Guests will enjoy rooms with period furniture, unique breakfast dishes that change daily, and a tour highlighting the extraordinary history of the home. 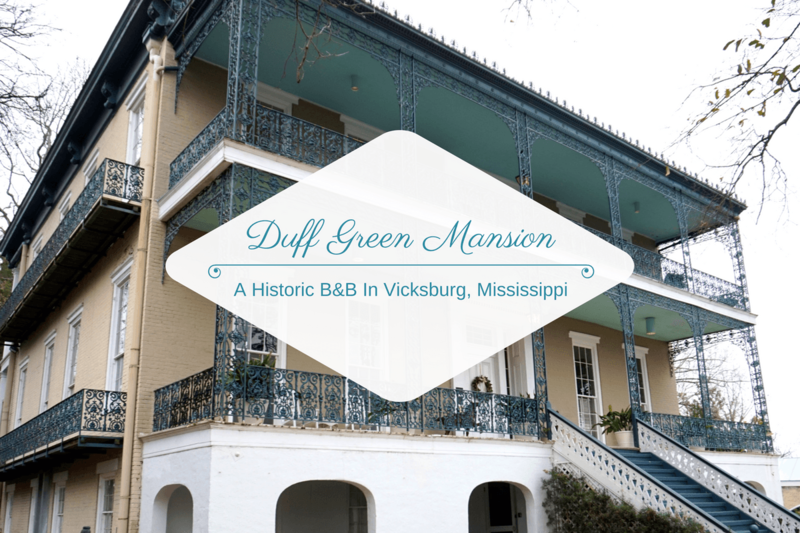 Vicksburg, Mississippi is a city rich in history and beauty, and to really feel a part of this, we recommend staying at the Duff Green Mansion. This Vicksburg bed and breakfast is full of antiques and period furniture and visitors will get to know what it was like to stay in an antebellum home. Duff Green Mansion was built in 1856, by Duff Green for his new bride Mary Lake. Green had set out to create a home that all of his neighbors would envy, and one that him and his wife could easily entertain guests in. They had many parties in their home, with many distinguished guests. Even Jefferson Davis danced in their ballroom! When the Civil War reached Vicksburg in 1863, Green designated the home as a hospital for both Union and Confederate soldiers. Doing this saved the house and many surrounding buildings from bombings and further destruction. After the war, the home was used as many things, including a soldier’s rest home, orphanage, and even as headquarters for the local Salvation Army. Then, in the 1980s, the home was lovingly and meticulously restored back to its former glory. individual central air and heat, and cable television. During our visit, we stayed in the Duff Green Suite. This room was incredible, and we really felt like we’d gone back in time as there was period furniture throughout the bedroom and sitting room. Look at this antique bed! And yes, we did have to use the step ladder to get into bed lol! The bathroom was a bit more modern though. It had a renovated claw-footed tub and separate shower. Guests wake up every morning to a delicious three-course seated breakfast in the formal dining room. Breakfast is served at 8:30am, and it was fun to sit with other guests and chat about our plans for the day. If you do need an earlier or later breakfast, however, they can accommodate your request. Every morning we were given a small dessert. Yum! With your stay, you also get a complimentary tour of the mansion. The tour starts around 9am, once everyone is done with breakfast. Public tours are also offered throughout the day at a cost of $12 per person. The tour lasts about an hour. The history of the mansion is incredible and the tour really brought it to life. Is Duff Green Mansion Haunted? There are plenty of haunted hotels in Mississippi, but is Duff Green Mansion one of them? With the role it played in the Civil War, it wouldn’t be surprising. We found out during our tour of the property that the bathroom in our room had been used as a morgue during the war. So… we will freely admit here that at night we slept with the bathroom light on. We didn’t want to take any chances! It’s been said that people have seen the ghost of a Confederate soldier, the ghost of Mary Green, and the ghost of the Green’s daughter Annie, who died at the age of six. Hearing about these sightings freaked us out a little. We tend to freak out easily when it comes to ghost stuff. The only other tour we’d done of a haunted place was the Rose Hall Great House in Jamaica. Luckily, we didn’t see or feel anything. But that’s not to say the sightings aren’t true. If you’d like to read more about the possibility of Duff Green Mansion being haunted, we recommend reading this article by Paranormal Inc. They went to the house and did some tests. I love staying in B&Bs as each one is unique and reflective of their destination. For me my favorite part of any B&B is the breakfast. That cheese grit souffle is calling my name! It was so good! Such a great way to start the day! I like it when the vintage or heritage homes like Duff Green Mansions have everything from a period but they have modern bathrooms. I wonder how it would be to use the vintage bathrooms if we had to. Delicate grill work looks so elegant. B&Bs are great lodging options. You feel more at home especially with the hot breakfast in the morning. Having a historic legacy like that of the Duff Green Mansion in Vicksburg would be a decided plus! Except for the haunted stuff. I don’t like that! Haha! I completely understand Carol! I have stayed in a couple of B&Bs but nothing as grand as this. The interiors seem to have a royal classy touch. And it is so good they conduct a tour too. I would prefer to stay here if I get the opportunity. I love historic b&b’s like this. I enjoy stays so much more when the place has character rather than a hotel room that is standard no matter where in the world you are. I’d go for those homemade waffles alone! We completely agree Jennifer, it’s a very special place! This is amazing.This is fantastic and it seems to be more special to be here.I would love to do breakfast here, this mansion is a one we all dreamt off. I love how regal all the rooms look. This is exactly my favorite decor! I will have to bookmark this for my next trip. Visiting Duff Green Mansion looks amazing! I’ve never thought of Vicksburg as a destination, but this place looks worth it. Their breakfast looks so delicious, especially those waffles and the cheese grits soufflé. Duff Green Mansion sounds like a great place to stay at, especially because it has history. I love places with a story, especially haunted. So spooky that the bathroom was used as a morgue, I can totally understand why you kept your lights on while sleeping 😉 The breakfast looks pretty god too and it’s nice that they provide a tour of the house.